This photo from July 2011 shows the green toxic algal blob that hit much of the western portion of Lake Erie. This is a critical time in the calendar for Lake Erie. The lake is reawakening from one of its longest and most ice-encrusted winter slumbers in recorded weather history, and the next several weeks will determine just how blue and healthy – or green and toxic – its waters will be this summer. 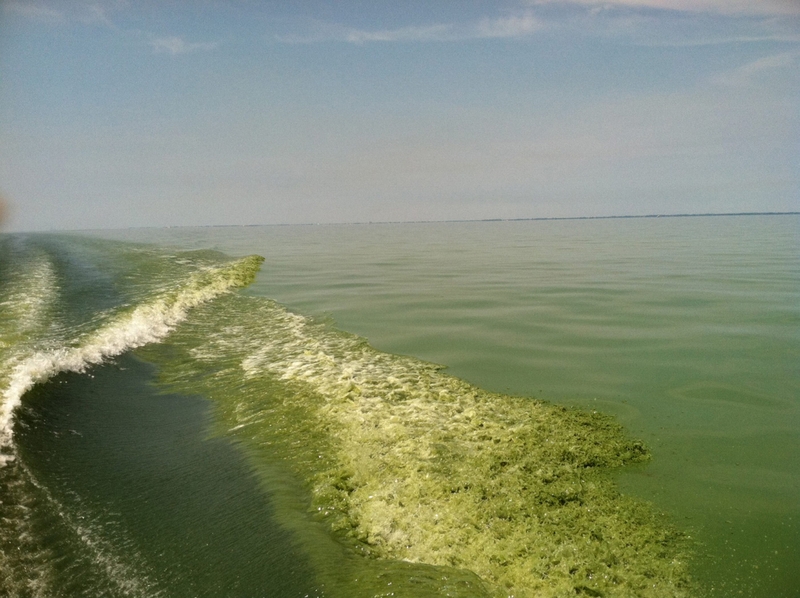 Driven by high levels of dissolved phosphorus in the lake from agricultural runoff and other sources, the bright pea-soupy green toxic algal blob that conquered much of the western portion of the lake in 2011 returned in force last summer. For the first time, the harmful blue-green algae – actually cyanobacterial-borne hepatotoxin or neurotoxins – appeared as early as mid-July. They later overwhelmed an Ohio water treatment plant and cropped up as far east as Presque Isle State Park in Erie, Pa.
As a collateral consequence, massive algal blooms from the shallow western part of Lake Erie drift eastward and die in the central part of the lake. Decaying dead algae then rob the water of its oxygen creating vast “dead zones,” where little marine life survives. That’s why fears abound about what’s in store for 2014. What damage will the harmful algae wreak this summer? Will they just close beaches in Ohio or shutter more drinking water plants? Or crop up even closer to Buffalo? If above-average precipitation in the watershed continues this spring, most lake experts agree the news will not be good. That’s because wetter than usual spring months pick up fertilizer spread across the rich Midwest farmland in late fall and early winter and carry it into nearby tributaries and rivers. Eventually, it winds up in Lake Erie. That fuels higher levels of phosphorus in the lake, and with it, more algal growth. The harmful algal blooms usually begin in the shallow, western basin of Lake Erie in the mid-to-late summer, but the length and severity of the blooms typically are driven by the amount of total phosphorus pouring into the lake from the Maumee River between the months of March and June. “What is happening this spring in the Maumee watershed will drive the severity of the bloom,” said Joseph V. DePinto, senior scientist based in an Ann Arbor, Mich. The Maumee – a more than 4 million-acre watershed – carries waters from tributaries in an overwhelmingly agricultural part of northwestern Ohio and parts of Michigan and Indiana, depositing them into Maumee Bay at the western end of Lake Erie at Toledo. In that same area, the Detroit River empties overflow sewer runoffs from aged wastewater treatment plants in the cash-strapped Motor City, adding to the amount of phosphorus in the western lake waters. Now add the extensive ice cover, and some informed people worry. The last time Lake Erie was as ice-covered as it was this winter was in 2011, and that summer was the high-water mark thus far for toxic algae, noted Sandy Bihn, the executive director of the Oregon, Ohio-based Lake Erie Waterkeeper organization. So, if this proves to be another bad year on the lake, it might not be a coincidence. The first of those ingredients already seem to be in the mix. One needn’t belabor the point about how extreme 2013-14’s winter was across the Midwest and Northeast. As late as March 6 this year, Lake Erie was more than 96 percent frozen over, the highest ice concentration in years. In 2011, the last time the lake was as covered with ice, it hit a maximum of 94 percent covered with ice Feb. 8. And, just as the Buffalo region experienced, it was a heckuva year for snowfall in the Maumee River watershed as well. Take for instance, Toledo, where a lot of winter’s 85.3 inches of snow melt – 2½ times its annual average – would help saturate the ground or eventually be carried down the Maumee into Lake Erie. The northwestern Ohio city at the mouth of the Maumee only picked up 38 inches of snow in the winter of 2010-11. To further illustrate the point, in 2012, the three Maumee watershed cities averaged more than 5 inches below normal for precipitation between February and June. The algal bloom in the lake that summer was minimal. Overall precipitation this season, thus far, remains well below the nearly 7 inches above normal the three cities along the Maumee averaged during the drastically wet spring three years ago in 2011. That year, Fort Wayne, Ind., which picked up close to 25 inches of precipitation between February and June, recorded its wettest spring in 114 years. That’s why experts say the rest of this month, May and June, will play a momentous role in how the lake waters will fare later this year. “The weather from now until July will have much more effect on the summer bloom than any weather we have had to date,” said Thomas B. Bridgeman, associate professor of the department of environmental sciences at the University of Toledo’s Lake Erie Center. At some point soon, experts agree stakeholders along Lake Erie’s shoreline don’t want to have to be crossing their fingers and hoping Mother Nature delivers a dry spring to keep the blue lake waters from turning bright green. It’s why the International Joint Commission, in its report of the Lake Erie Ecosystem Priority from late February, calls on governments in the United States and Canada to take legislative steps to cut phosphorus going into in the lake, especially in the Maumee watershed, through regulatory and nonregulatory reforms. • Setting phosphorus reduction targets on both sides of the border. • Reducing phosphorus loading into the lake from agricultural sources and septic systems. • Reducing phosphorus loading into the lake from urban sources by promoting green infrastructure and stormwater management plans. • Strengthening monitoring and research on and around Lake Erie. In Erie County, Pa., a task force was established last year to deal with algal blooms after toxic algae sprung up for the first time in a few places along Presque Isle Bay in Erie. Task force officials are focused on continued monitoring of the water as well as keeping the public aware of the potential danger of the toxic algae through education and posted signage in the area. Back in western Ohio, it’s an ongoing endeavor for Bihn and others who, near the mouth of the Maumee, really live at ground zero. Legislators in Ohio last week approved a bill designed to help the lake that would require farmers to receive state certification in order to apply commercial fertilizer across at least 50 acres of land, according to a report in the Columbus Dispatch. Incentives are also provided in the bill for farmers “who voluntarily develop state nutrient-management plans and keep accurate records,” the report stated. “Is it going to solve all the problems that we have right now in our lakes and streams? Well, it’s going to be a step in the right direction,” the bill’s sponsor, Ohio Sen. Cliff Hite, told the Dispatch. Bihn is less bullish on her state’s new regulation as a solution. She says it doesn’t have much teeth to it and only targets part of the problem. For Bihn, directly restricting the total maximum daily load of dissolved phosphorus allowed to be discharged is a necessity to arrest the spread of toxic blue-green algae before it gets even worse.